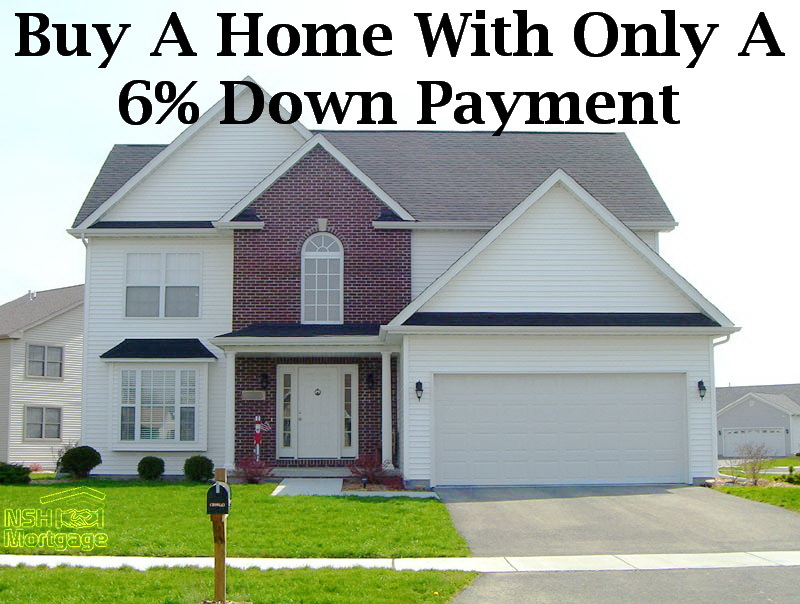 Buy A Home With Only A Six Percent Down Payment. NSH Mortgage has the knowledge and tools to help you buy a home with only a six percent down payment. Eager to buy a home but worried that you lack the down payment to get your foot in the door? This is a standard interest among mortgage candidates who are frequently told that they need to raise at least 20 percent of their home price as a down payment. Surprisingly, however, the median down payment made by first-time buyers is actually only six percent, according to a recent National Association of REALTORS® (NAR) survey. Many prospective borrowers do not fully realize the options available to them especially those related to low down payment loans. Increasingly, home-buyers are learning the facts about available loan programs that require little to no down payment and far from perfect credit scores. Several mistaken convictions about home financing are stubbornly persistent. Many borrowers believe that their minimum down payment must come from their own funds and cannot be from a gift, or if they have a credit score below 620 they will not qualify for full financing, or that qualifying ratios are measured from their net income instead of their gross income. What has more, too many loan candidates think down payment assistance is only available to low income buyers. In fact, 70 percent of U.S. adults exhibited that they were unfamiliar with down payment assistance programs for middle income home-buyers in their community, according to a NeighborWorks America survey. Kathy Cummings a first-time home buyer expert with Bank of America, says that too many home seekers make assumptions that they will not qualify. Worse, they excuse themselves prematurely from opportunities available to them including low down payment programs. Perceived lack of funds for a down payment has long been one of the most common barriers to buying a home. These miscalculations persist due to lack of information about the evolving mortgage market, which actually offer programs of great value. There is no lack of low and no down payment options available in today’s market and giant mortgage rule makers like Fannie Mae and Freddie Mac have rolled out powerful new programs. These supplement loan types that have been around for years. Among the applicable options available to eligible borrowers are as follow. The Federal Housing Administration’s (FHA) loan offers 96.5 percent loan to value (LTV) financing (3.5% down). Your total down payment amount can come from a cash gift, making it in essence, a zero down loan. Credit scores as low as 580 can qualify, although some lenders require at least a 620 score. About 23 percent of homeowner occupants finance their purchase through a low down payment FHA backed mortgage. Fannie Mae’s HomeReady™ mortgage is an enticing choice for first-time and low to moderate income borrowers. It requires just three percent down and offers a 30 percent reduction in mortgage insurance costs. Buyers need a minimum credit score of only 620, and borrowers with no credit history may use nontraditional credit accounts to qualify. HomeReady™ is ultra flexible on income sources as well. The lenders will consider income from household members who will not be on the loan. Income from roommates and boarders will help the buyers will qualify as well. This Freddie Mac program offers 97% LTV financing. At least a 660 credit score is required, and income limits apply. The entire down payment can come as a cash gift from a family member, making this a zero down loan option for many buyers. U.S. Department of Veterans Affairs (VA) no down payment loan is increasing in popularity. The NAR reports that 11 percent of homeowners finance their home purchase with a VA home loan. This mortgage type provides up to 100 percent financing for qualified veterans and active service members. These loans offer distinct savings over other loans. They do not require mortgage insurance and rates are up to 0.40% lower than those of conventional loans. These two features can cut the buyer’s housing costs by hundreds per month. The U.S. Department of Agriculture’s (USDA) home lending program loan extends up to 100 percent financing for qualified buyers in rural and suburban areas. The loan is known as a USDA home loan or Rural Development loan, and is extended by local banks and mortgage companies across the country. Even buyers near metropolitan areas should check this loan type if they plan to buy in surrounding suburbs. Numerous programs exist, bestowed by many cities, counties, and states across the country. These programs offer money to cover down payment or closing costs with a 3.5 percent down FHA loan. Some programs forgive the amount of money granted. Others require a payback of all the money in the future. Many municipalities offering DPAs have limited funds available allocated on a first come, first serve basis. New home buyers should check local programs. Down payment assistance can speed the time it takes to save enough for the upfront costs of home-ownership. Most of this aforementioned loan products will enable nontraditional or limited credit to qualify for the mortgage. Be prepared to furnish sufficient documentation when applying for any of these options, and be aware that some of these loans require you to have mortgage insurance, although possibly at discounted rates. Getting approved for these programs nowadays can be easier than you think, so do not be scared off by the paperwork involved. Today, lenders are better able to measure a borrower’s ability to repay and, along with loosened credit criteria, borrowers are experiencing positive results. If you do not qualify for the lowest down payment option available through one of these programs, you can increase your chances of being eligible by working to improve your credit.